Ireland continues to be a laggard in reducing emissions even though we are a world leader in using wind energy. The reason for this is simple: wind energy alone cannot reduce emissions to the low levels required if we are to play our part in the global task of tackling climate change. Smaller, safer reactors now coming to market are expected to supply the cleanest, cheapest and safest electricity available. They will be ideal to replace coal and peat burning in Ireland by 2025 to 2030. It is generally accepted that Ireland’s energy policy is uneconomical, disruptive, unpopular and ineffective. While Nuclear alone can’t solve all these problems, it could be very useful at helping Ireland to develop an energy system that is clean, affordable, safe and reliable. The energy policy is uneconomical as it will lead to ever-increasing costs the more it is implemented. A recent joint study by UCC and ESRI estimated the cost of implementing the policy using existing technology to eventually exceed €20,000 per tonne of CO2 – while the market price of CO2 is less than €30 per tonne. These levels of cost are not sustainable. Meanwhile, new nuclear plants offer the cheapest clean energy available. The policy is disruptive as it requires the extensive construction of wind farms, solar farms etc throughout the country and near many homes, villages and towns where they are often not welcome. There is also a need to connect these installations with overhead cables, pylons and sub-stations. Instead, we could install small, safe nuclear plants at existing power stations and use the existing overhead network, with far less disruption. It is no surprise that some wind farms are unpopular as they can cause visual, noise, financial or other nuisances to people who do not believe the benefit is worth the intrusion. Installing new nuclear at existing power stations would preserve the existing jobs and infrastructure while improving the environment surrounding these stations. That the policy is ineffective is obvious when the EPA says Ireland will miss its 2020 emissions limits by many millions of tonnes. And we are unlikely to meet our 2020 Renewables targets in Electricity, Heat or Transport. Using new nuclear would allow us to meet our emissions targets in an affordable manner while still maintaining a reliable energy supply. Given that we will miss our Emissions and Renewables targets, incur extra costs and inconvenience in building overhead lines and pylons, cause widespread protests over wind farms and so on, and face large increases in costs associated with this inadequate policy, why not step back and take a look at what Nuclear can do for Ireland? We should especially consider what role nuclear will play when our coal fired station at Moneypoint closes between 2025 and 2030. By then, small, advanced Nuclear Energy will be the cheapest and safest means of generating low-carbon electricity and, by storing heat in the solar salts, could be ideal partners for Renewables and help reduce our energy related emissions. New Nuclear will lead to small plants – suitable for Ireland – with no emissions and they can even use nuclear waste as fuel! But the current legislative bans on nuclear energy in Ireland are preventing us from allowing nuclear to help our renewables supply clean, cheap and reliable electricity. The 2014 Green Paper on Energy Policy in Ireland questioned whether nuclear energy has potential for Ireland, given the significant threats posed by climate change and by volatile fossil fuel prices. 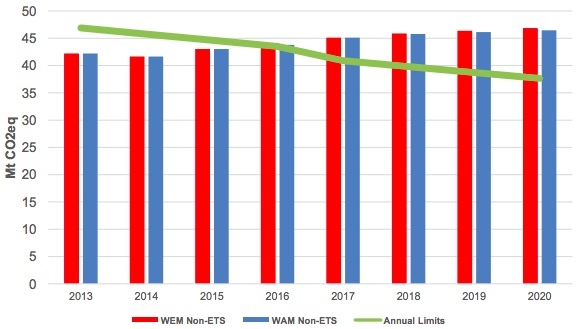 While it accepted the useful but limited role that renewables can play in our energy future, the subsequent 2015 Energy White Paper failed to answer the question. The question of nuclear energy arises now because the coal burning station at Moneypoint, which provided our most affordable baseload electricity since 1985, approaches its end of life by 2025. It is critical for our society and economy that we select its most appropriate replacement in terms of affordability, emissions, reliability and safety. The Intergovernmental Panel on Climate Change (IPCC) clearly outlines the need to reduce greenhouse gas emissions significantly, leading to increasingly strict EU emissions targets. 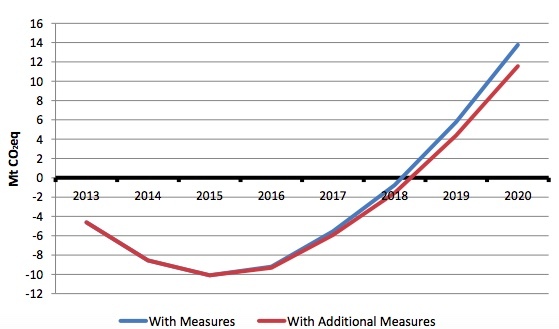 The graph below shows the EPA projection that Ireland will exceed our 2020 emissions target by up to 11.5 million tonnes at a cost of some €250 million – even if we fully implement everything we currently plan to do and despite our excellent renewable resources. No existing low-emissions technology can easily replace Moneypoint’s reliable baseload output. Regular hydro power is effectively fully utilized in Ireland; wind energy is intermittent as it depends on the weather and so is unsuitable as a baseload supply; while emissions from gas-fired generation are excessive as they are almost half that from coal. Our current concentration on gas and renewables may be adequate to 2020, but thereafter we’ll require at least one other technology to lower emissions sufficiently at reasonable cost and with adequate reliability. What technologies can replace Moneypoint? Some innovative solutions have been proposed but none are progressing as speculated. Of these, wave and tidal systems are extremely unlikely to reach even our target of 500 MW installed and they will be intermittent and expensive; large-scale pumped storage has made little effective progress since it was first mooted five years ago; and Carbon Capture and Storage systems are still unproven while the storage of captured gas in Ireland is now prohibited. An earlier proposed biomass solution is currently out of favour, however, and many environmentalists have serious concerns about its impact. There is good support in Ireland for considering nuclear energy. Many significant Irish organisations (including EirGrid, ESB, Commission for Energy Regulation, Forfás, The Competitiveness Council, IBEC and ICTU) have called for nuclear to be considered here, as have a number of independent experts and all the national newspapers. In July 2014, the CEO of ESB said that he “didn’t disagree about it [the need to go nuclear] at all”. He also said that there is a case for nuclear on the island of Ireland only if the size of nuclear plants was to be appropriate for us, and we explain below that suitably sized plants will be available before Moneypoint is retired. But what about the fact that nuclear energy has been contentious in Ireland since the 1970’s when ESB proposed a nuclear plant at Carnsore Point, Co Wexford? The argument was that nuclear power plants were not safe; they were too expensive and too big for Ireland; that we couldn’t build them and the waste is too dangerous. The answer lies in the smaller modular reactors (SMRs) under development in the US, Britain and elsewhere. These advanced reactors address the most popular of the reservations people have about nuclear energy. At around 200 MW, SMRs are smaller than some of our existing generators and are ideal for Ireland. Emissions: Nuclear has near-zero emissions as can be seen in this graph. A nuclear station the size of Moneypoint would save over 5 million tonnes of CO2 per year compared to coal and over 2.5 million tonnes compared to gas-fired combined cycle plant. Each of the low carbon options (solar, biomass, nuclear, hydroelectric and wind) should be assessed before deciding on our energy strategy for a sustainable future. This assessment is best conducted by an independent group of experts. Safety: SMRs are based on nuclear submarine technology, which has an impeccable safety record. They incorporate the lessons learnt from earlier failures and have “passive safety”, making them even safer than existing reactors – no operator intervention is required for up to 14 days even if all backup power is lost. And they cannot explode like a nuclear bomb under any circumstances whatsoever. Nuclear is the safest baseload power generation technology on an objective like-for-like comparison. This is reflected in the fact that there are more reactors planned or proposed now (482) than before the Fukushima accident (478). Even Belarus, which was impacted most by Chernobyl, is building its first two nuclear units with two more planned for around 2025. Cost: SMRs can produce electricity for between 5 cent and 8.4 cent per unit, which is much cheaper than Britain’s 9 pence per unit from its new nuclear units. 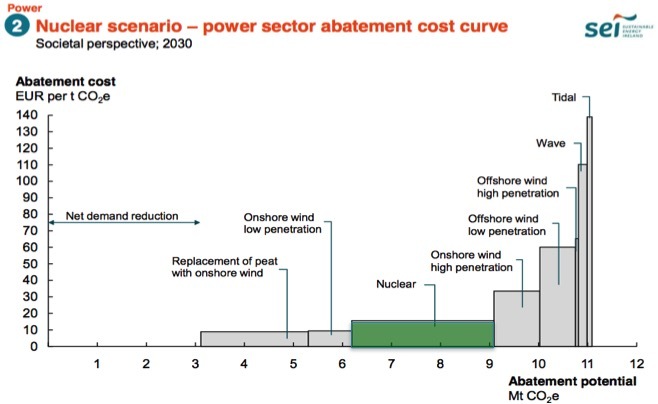 This cost curve (from a Sustainable Energy Authority of Ireland report) shows how it is cheaper to reduce emissions using nuclear than using large amounts of onshore wind or using offshore wind, wave or tidal energy. Note that SMRs would reduce costs significantly compared to the nuclear plants used in the SEAI study. Construction: While larger reactors often overrun their lengthy construction estimates, SMRs are built in factory and require minimal assembly on site, reducing build time to 3 years. Improved build reliability leads to improved project certainty, which greatly reduces project risk. This, in turn, lowers the cost of finance, which reduces the final cost of electricity. By installing the units sequentially, the first SMR would be operating and earning income before the next is underway, thus reducing the total sunk capital requirement to levels affordable by privately owned utilities – no State investment or subvention would be required. Waste: Under International agreements, such as proposed by the International Framework for Nuclear Energy Cooperation, Ireland would source its nuclear fuel from an existing nuclear nation to whom we would return all the spent fuel for safe storage or reprocessing. There is now over 60 years of experience in storing spent fuel from nuclear power stations, and there has been no serious incidents with this fuel to date. Reliability: Nuclear reactors are typically available for over 90% of the time. 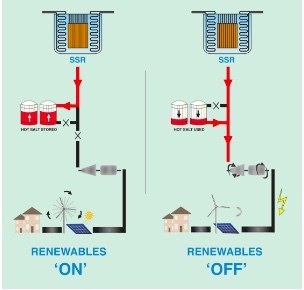 Compatibility: Cheaper power from SMRs can offset the higher cost of certain renewables. Crucially, like nuclear submarines, SMRs can change power output quickly to accommodate intermittent wind and solar energy, resulting in a clean, reliable, safe and affordable electricity supply. 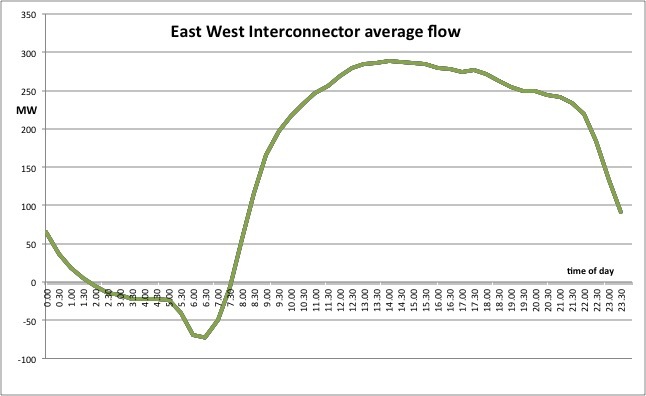 Interconnector: The graph below outlines how we import far more energy during the day, when prices are highest, than we export overnight (when prices are lowest). Lower energy prices from cheaper Irish Nuclear would allow us to export electricity, improve competitiveness in Ireland, improve our balance of payments and increase employment. It is also important to note that maintaining control of our electricity supply improves energy security. ‘Should Ireland start using nuclear power?’ Over half the respondents in favour. 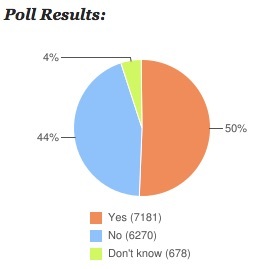 Public opinion on nuclear energy in Ireland has not been sought comprehensively to date. Evidence of public support is clear from this July 2016 online poll asking whether the ban on nuclear power should be lifted – 50% were in favour with 44% against, from a poll of 14,129 respondents. A comprehensive and unbiased assessment of public opinion should be sought on the matter. 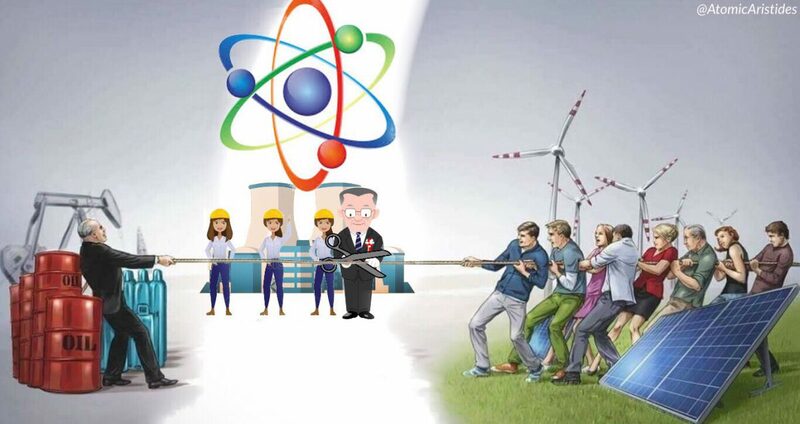 Objections: While nuclear energy is contentious, there is large public opposition in Ireland to almost every significant piece of proposed infrastructure including gas fields, wind turbines and electricity pylons. However, nuclear has one clear advantage over the others: it could be installed at an existing power station and use existing electricity transmission cables, concentrating the argument into a single location. This could avoid the type of expanding protests now being witnessed against wind turbine and grid expansion projects nationwide. Political Instability: The increasing political instability in the Middle East and Russia will make it essential that Ireland diversifies its sources of energy as it is no longer certain that it will be able to obtain energy supplies from these regions in the foreseeable future. Nuclear energy would provide considerable independence from these regions and help ensure security of supply. Siting: Moneypoint is just one of a number of suitable locations in Ireland, each of which could have a number of SMRs providing hundreds of high quality jobs in a safe and clean environment. Opportunities: Local colleges could train nuclear engineers, operators, maintenance staff, environmental monitoring and protection staff and so on. Meaningful jobs could also be created in the areas of simulator training, foreign consultancy, civil defense, communication and marketing, finance and so on. Local County Councils would benefit hugely from significant rates, secured for 60 years or more. There would also be many service jobs in these communities and the prosperity of the entire region would be enhanced by the presence of the SMR plant. National competitiveness would also receive a boost through lower guaranteed cost of power for businesses throughout Ireland. The cost of not going nuclear: To illustrate the long-term effects of national energy policy decisions, consider the cases of Ireland and Finland. Both these countries proposed the Nuclear Non-Proliferation Treaty in the 1960’s and were the first signatories of this treaty when it came into being in 1968. Within 12 years, Ireland had rejected nuclear power generation while Finland adopted it. Now, Finland has a balanced portfolio of fuels in its generation mix, producing around 30% from nuclear, around 50% from hydro, with the remainder mainly coming from coal and gas. Ireland, on the other hand, has over 60% from gas, 15% from renewables and the remainder is from coal and peat. As a result, Ireland’s power generation emits around 4 times more CO2 per unit of electricity than Finland. Critically, electricity is 50% more expensive for Irish households and 100% more expensive for Irish industry than for their Finnish counterparts. This is a clear and practical illustration of the economic and environmental benefits that Ireland is passing up with its current prohibition of nuclear power. Ireland will need a mix of generating technologies including renewables, gas and nuclear to keep energy affordable while meeting our environmental targets. To help achieve this, we should study the potential of nuclear energy, and particularly SMRs, without delay. We should also repeal the current legislation that precludes us from using nuclear energy. There is a tremendous potential opportunity for Ireland to take full commercial advantage of being the first European nation to deploy small nuclear reactors while moving further towards a low emissions, lower cost energy supply. Rather than being seen as a threat, nuclear energy can work to our advantage. The time to consider whether we want to seize this opportunity is now. If we decide not to pursue nuclear energy, then we must clearly identify an adequate alternative and fully understand the economic and societal cost implications of adopting that alternative. What about the corrupt agri finance types who would make no cash out of nuclear. Technically a bit beyond their understanding. They only understand heifers , bulls and bullocks and EU subsidies. Like Cattle subsidies and wind farm subsidies. They , the agri finance types, do not really understand that machines are different than heifer, bulls and bullocks but the subsidies come from the EU. Where all the heifers, bulls and bullock subsidies come from. They talk the same subsidy language. Producing electricity a couple of kilowatts will do then sell on. Then back to to heifers bulls and bullock subsidies. Wind losses a well it was government let the commoners can pay for that. Excellent article. This is something I have believed for many years and I think your suggestion of small modular reactors is the very best option currently. You mention SMR have an output of 200 mw, I wonder are there issues connecting reactors in series. The reason being, that your example of Moneypoint generates approximately 1000 MW which would require five small modular reactors to replace. My gut feeling is that we should have small modular reactors rather than single large reactors for the reasons you mentioned previously. I also note that with current legislation banning petrol and diesel cars within the next 20 years will lead to a doubling of current electrical demand to facilitate a car fleet today running at approximately 2.5 million. I estimate a power requirement in the region of 1500 to 2000 MW Minimum for this alone. I would be interested to know if you have dealt with any politicians to discuss this strategy and is there any movement in this direction. Thanks, Andrew – you make a number of good points here. Sorry for the late reply but I was away last week. As there is nothing unique about how a nuclear powered generator would fit into an electrical grid, there would be no problem in having a number of them in a single power station. One possibility is to have 5 or 6 SMRs of 200 MW each at Moneypoint, whose cables are capable of supplying over 1200 MW to the east coast of Ireland. The general idea is to electrify as much heating and transport load as we can realistically, while we decarbonise electricity using all low-carbon power sources including renewables and nuclear. Biomass and CCS (carbon capture and storage) are unlikely to meet our environmental and economic needs. While a number of politicians agree with this strategy, there has been no political movement in that direction as yet. But it is increasingly obvious to anyone who looks at the matter objectively, that while it will still be very difficult to meet our emissions targets by including nuclear in the mix, it will be almost impossible without nuclear. Public interest in nuclear for Ireland is most certainly on the increase. I saw in one of the Sunday papers (since mislaid) that the advantages of SMRs were exaggerated, that they are only at the development stage and will not be available before 2030 at the very earliest. As well as that the article stated that the price of these SMRs would be prohibitive. I was wondering did you see the article and if so can it’s contents be refuted. I didn’t see the article but, from what you say, it would appear to be far too pessimistic. 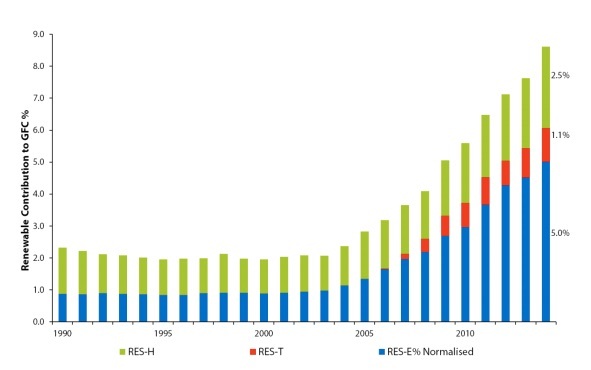 While there a number of small reactors already available worldwide, some of the newer SMRs are making steady progress. One of these is based on the pebble bed concept and will produce around 200 MW of electricity. The 2 reactors are already built and have their fuel loaded while the steam turbine is ahead of schedule. It should be commissioned later in 2018. See http://www.world-nuclear-news.org/Articles/HTR-PM-steam-generator-passes-pressure-tests . It’s the Chinese High Temperature Reactor (HTR-PM). NuScale, a 60 MWe US Pressurised Water reactor, is on schedule for the first unit to be in operation around 2023 at a cost of $4200 / kW and producing electricity for around $70 / MWh. See https://www.nuscalepower.com/ . Reactors such as these are likely to be far cheaper than the 70% Renewables paper recently published by the Wind Energy Association, which estimated costs of €10 billion (they call this an ‘investment’ while everyone knows it is a cost) and would still not reduce our emissions to the levels they need to reach if we are to do our bit in tackling climate change effectively. I could respond more fully if I saw the article, though. Are you planning a response? Thanks for the reply. I cannot lay my hands on the paper or remember which one. Anyway I don’t have the technical knowhow to go public. Your reply is very useful for me to build up a base of technical knowledge. Sir, I can no longer sit idly by while our Department of Communications Energy and Natural Resources (2015-2030) fails to mention the word ‘nuclear’ in its Transition to a Low Carbon Future. The country is likely to be largely dependent on wind and solar energy with eventually a moderate contribution of wave, tidal and biomass. In this situation it is irresponsible and, I think, dishonest to ignore the recent development of a variety of small modular reactors (SMRs) which vie with renewables in low carbon dioxide emissions. These could be a necessary and cost-effective back-up to cope with fluctuations in supply (irregular and unreliable) and demand (time and weather dependent). So, do get involved too! Consider the announcement yesterday that Bord na Móna is to start laying off significant numbers of its work-force. “Union warns Government is ‘sleepwalking into a crisis which will devastate Midlands’”† You would think that with (1) popular sentiment around 50% in combination with (2) the latest IPCC report and (3) with the news that now is the time to switch from burning our bogs to a more sustainable source there could be a push to investigate building a next-gen nuclear reactor in Ireland. We’re in a non-seismic zone. We have access to plenty of water. We have a talented work-force (I personally have met nuclear physicists who had to emigrate to France because there is no work in Ireland). The number of countries around the world including nuclear power in their energy mix is rising. If we’re not part of EurAtom we could be in the morning. We could access Chinese and French tech and money easily. All we need is the political will. I get that people are afraid of nuclear power. But many of these people think with their gut and their feelings rather than thinking about the situation dispassionately. If you’re serious about climate change but declare nuclear power is not a viable option I reckon that removes you from rational discourse. Perhaps the time has come to establish a lobbying group post-haste to get a law enacted to allow public and private research into nuclear power in Ireland. The technology is practically 100 years old. Like Italy which is also in denial, we’ll be importing nuclear generated electricity anyway so we may as well build the damn things ourselves. I’m thinking Donegal. Some great points there, Anthony. Fortunately, we are already in Euratom, as is every member of the EU. Euratom was 1 of the 3 pillars that formed the original European Community back in the mid-50’s and has been kept pretty much intact ever since. So, access to fuel is guaranteed if we ever decide to use nuclear energy directly in Ireland – rather than import it from the UK and, in time, from France. I agree that it beggars belief that we are completely ignoring the potential of nuclear energy at a time that the UN is telling us – and we agree – that we must do everything we can to tackle the causes of climate change. There are a number of good sites in Ireland for our first nuclear power station. Moneypoint in Co Clare would be ideal, where it could directly replace the coal fired units that are due to close by 2025-30. Carnsore Point would also be a good location, and would bring many benefits to the local area. Would you like to help us in lobbying for a sensible approach to nuclear in Ireland? Our political leaders will only follow the will of the people, as ever, so the lead must come from us. I have read the above with interest. I am very worried for the future of my children and grand children – indeed planet earth as a whole! The legislation preventing Nuclear power in Ireland MUST be REPEALED immediately. That’s the first step. The second step is to educate the people on how clean nuclear power can be, emissions-wise. Third step is to get as many politicians and councillors on board to move public opinion in the direction of an emissions-free energy policy for Ireland. I’m 63 and went to Carnsore for the protest in the 1970s – have the photos to prove it!!! Back then nuclear was considered expensive and dangerous. Now the technology has completely changed, the SNRs have a proven track record. Young people in this country are living with the double whammy of an ecological time bomb and an economy that prevents so many of them from having their own home. Ireland could lead the world in the nuclear field: we have the talented, educated, young population that could deliver a safe and sustainable power industry. I was at Carnsore Point too, but there are no photos to prove it – that I know of! You are right when you say that modern nuclear is so different from the plant that was proposed for Carnsore, even though the same type of unit was started up in Slovenia in 1983 and is still operating at full capacity today. In the 36 years since then it has produced reliable, affordable and carbon-free power for Slovenia and Croatia through good times and bad. Ireland went on to commission Moneypoint in 1985 and that power station has emitted over 130 million tons of carbon dioxide since then. So, it appears our attendance at Carnsore ended up having a very negative effect on the environment, despite our best intentions. There are a few ways to help the cause and anything you can do would be much appreciated by those who have a genuine interest in protecting our climate while maintaining a good quality of life. These include contacting your local councillors and TDs and letting them know that you want nuclear energy to be legalised and then considered in Ireland. You could contact your local or national radio or TV channel and voice your support for nuclear. Maybe we should attend the Climate Action rallies and march under a pro-nuclear banner? That might get more people talking about nuclear and, more importantly, alert Ireland to the need to take urgent and effective action to have a positive influence on our environment and economy. We might be surprised at how many of our friends and neighbours would support us in such a march. Only just seen your excellent web site. Well done. Went looking after seeing your IT letter this morning. Have sent a reply as below. Your correspondent Denis Duff, letters 12/12, reckons that a major component of dealing with our climate change crisis, is the use of nuclear power. I am a renewables man up to the hilt, but not so blinkered as to disagree with him. When the great surge forward in nuclear energy technology occurred, we must remember it was in the throes of the Second World War and the reason for it, was the building of bombs, not making electricity. That dictated that all the research went into Uranium and not the much safer option of the Thorium route or other options , which are useless for bombs. The objective of bringing forward Thorium technology aimed at the development of mass produced, modular reactors is being pursued in a number of countries and combinations of same, including of course the leaders, India, with Russian / US and China, the great UN vetoists, close behind. Such reactors could be dropped in to all our existing power plants with total safety. However, this needs a massive “Manhattan Project” financial stimulus, but where are the hundreds of billions of dollars equivalent to come from. The answer stares us all in the face. Put an appropriately sized U.N administered tax per litre on aviation fuel, where at present there is none. All the right people pay and it is easily quantified and enforced, and would cause no trade distortion. If it put a damper on totally unsustainable air travel, that would be bonus in itself. [Phone number supplied but removed for Privacy reasons]. Thank you for your kind comment, Nicholas, and for copying your reply to the IT. [ For info, my letter in today’s Irish Times is at https://www.irishtimes.com/opinion/letters/climate-change-and-energy-options-1.3727974 ]. Your response is very encouraging. It appears that we will need both nuclear and renewables to give us even a slim chance of meeting our 2050 emissions reduction target. But there could be a significant cost difference between hitting these targets in the most economical way compared to our current policy. It’s an interesting idea to finance a nuclear-based low carbon future by taxing aviation fuel – who would sponsor such a plan through the UN? Most developed nations could finance a move from fossils to nuclear from their own resources, just as France and Sweden (to a lesser extent) did when they spent a concentrated decade in ‘going nuclear’. I suspect China could do the same. But developing nations would certainly need assistance if they are to avoid meeting their urgent energy demands with anything other than coal. Did you know that one of the salt-based reactor vendors, Moltex Energy, had an independent assessment of their capital cost at $2 per Watt? This is only a little more than Greencoat are paying for onshore wind farms in Ireland at the moment but would have well over twice the capacity factor. Operating cost is very low too, so the total cost per unit of electricity would be lower than for new gas or coal plant, especially when fitted with carbon capture technology. I hope your letter gets published and would love to see your idea being moved forward. Best chance is Mary Robinson’s Climate Action Foundation. Am working on it. She is very well got in the UN. The other mega remedial action is covered in Alan Savory’s work. Well got in the UN indeed, as former UNHCR! In her Climate Action Framework, is she open to nuclear? I think I recall she promoted a 100% renewables solution but haven’t seen any reference to her preferred mix in recent years – and I don’t recall it being covered in her recent blog series with the Irish comic (whose name escapes me right now). Please let me know if there’s anything I can do to help – even if its only to drop down your way for a chat or get-together! Very powerful talk from Alan Savory – thanks for that. You’re working on 2 very important actions! In 15 years time, 3 x 300 MW, BWRX-300 SMRs installed at Moneypoint would supply 25% od Irelands electricity for €1.6 billion. And, it would be the 24/7, low-carbon variety. There are really two conversations to be had here. 1) Is nuclear a necessary part of the energy mix in the fastest path to zero carbon? – Yes definitely. But it will take very big countries to design and build SMR’s and make nuclear affordable. 2) Is nuclear a necessary part of Ireland energy mix is we were to do all we can as quickly as we can (within political and economic limits) to go zero carbon? – that depends on when and what technology and what costs we can build nuclear in Ireland without the supply chains or skilled workforce. Job losses in Moneypoint and Bord Na Mona will be mostly semi-skilled jobs. will these workers get jobs in nuclear plants? when will SMR’s be available and affordable for Ireland? If the U.K. grid goes down, how badly would this affect Ireland ? Today’s electricity infrastructure, driven by commercial forces, will find it hard to cope when things go seriously wrong. The School Strike for Climate calls for social change to avoid climate change. But it appears that many people in Ireland are determined to resist any change in their opinion - whether founded on fact or not. How can we expect things to change unless we change things? Great article by Sean Duke in today's Irish Times. The topic of nuclear energy for Ireland has featured this week on RTE radio 1, Newstalk radio, TodayFM and the Irish Times. Given carbon emissions failure, should Ireland look at small nuclear reactors? Marcus Stewart on Why Nuclear? Colin Megson on Why Nuclear?